Although I don't pretend to be a true art connoisseur or art appraiser, my background in art history and curatorial experience have given me some knowledge about good art technique and production. As a result, I have developed my own opinions about what constitutes a "good" painting. In addition to considering color, composition, application of paint, proportion, etc., I have also formed the opinion that painters should always strive to work with live models instead of painting from photographs. I'm sure some artists would argue that "referencing" a photograph while working is sometimes helpful, and this may be the case. But I think that being a direct copyist of a photograph generally leads to some unfortunate results on the canvas. One of the main problems with copying directly from a photograph is that the figures in the final painting will appear unnecessarily flat. This flatness is a result of transferring a two-dimensional image (on a photograph) to another two-dimensional surface (the canvas). If the artist is trying to create an illusion of a three-dimensional figure, then it is important to use a three-dimensional model (i.e. a live model) in order to create this effect. In addition, using a photograph as a model not only makes the figures flat, but they can also appear unrealistically placed in their setting. In other words, the images look more like collage cut-outs that are just pasted into a setting. Consider this example "Wherefore Didst Thou Doubt" by Benjamin McPherson, an up-and-coming LDS artist who exhibited this piece at the 2006 Spiritual and Religious Show at the Springville Museum of Art. I helped to jury this exhibition. Although all of the judges determined that this painting was definitely good enough to merit place in the show, we all agreed that the artist relied too heavily on photographs instead of live models. As you can see, all of the figures in the painting look like cardboard cut-outs within the scene. There is little integration between the figures, as well as little integration between the figures and setting. For example, the boat looks like it has been cut out of a photo and pasted on the canvas. However, the flatness of the images is not the only evil which comes about from painting from photographs. In addition, there sometimes can be problems with proportion as well, especially if the artist is painting a group of individuals, all of whom were photographed separately. This problem with proportion can be seen in a detail of McPherson's painting. By examining the sizes of the figures, especially their heads, you can see that they are not proportionate with each other. This is because these images were photographed separately and then painted in a single composition like a collage. Had McPherson set up live models for his painting, it would have been easier for him to paint the figures in proportion with each other. While this show was up at the museum, visitors were especially verbal in their praise for McPherson's work. "It looks just like a photograph!" "How realistic!" were some of the laudatory remarks that I heard echoing from the area between the Music Gallery and the Dumke Gallery, where the painting was hanging. These comments saddened me, since I felt like calling a painting "photographic" is not really a compliment (which a few exceptions, of course, like the Photorealist movement from the 60's and 70's). If LDS artists continue to paint in this manner, then the public will continue to feel like this is "good art." However, if LDS people were exposed to better art, then they would be able to appreciate a higher quality of painting. On another note, I feel like McPherson really skimped on his application of paint (you could practically see the canvas! ), which also was saddening. If you're going to use paint, why not really use it?!? Although I have only seen one Greg Olsen original in person (it hung at this same show with McPherson's work), I noticed that Olsen also didn't have much paint buildup either (although he did have more than McPherson). Are these artists trying to make their paintings appear photographic by using as little paint as possible? It almost seems like the artists trying to deny the medium which they are using in favor of a photograph. If Jesus walked on the earth today, perhaps these painters would be photographers instead and give up the practice of painting - then they could get the aesthetic they are hoping for without bothering with paint! Do I have Greg Olsen fans up-in-arms with this post? What do people think? As a side note, I should also mention that there are some LDS artists which I think are very talented, technically speaking. J. Kirk Richards and Walter Rane are two noteworthy LDS artists. If I extended this discussion to include LDS artists which paint religious and non-religious themes, then I would also have to mention one of my favorite Utah artists, Brian Kershisnik. 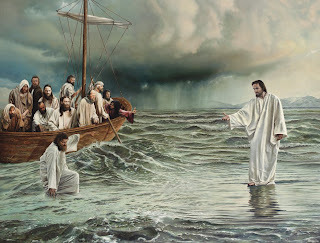 1 In this post, I am defining an "LDS artist" as a Mormon artist who primarily paints Christian/Mormon subject matter.